WASHINGTON, D.C.—During colloquy, House Republican Whip Steve Scalise (R-La.) questioned House Majority Leader Steny Hoyer (D-Md.) on whether Democrats will include border security funding in the conference committee’s negotiated legislation next week. 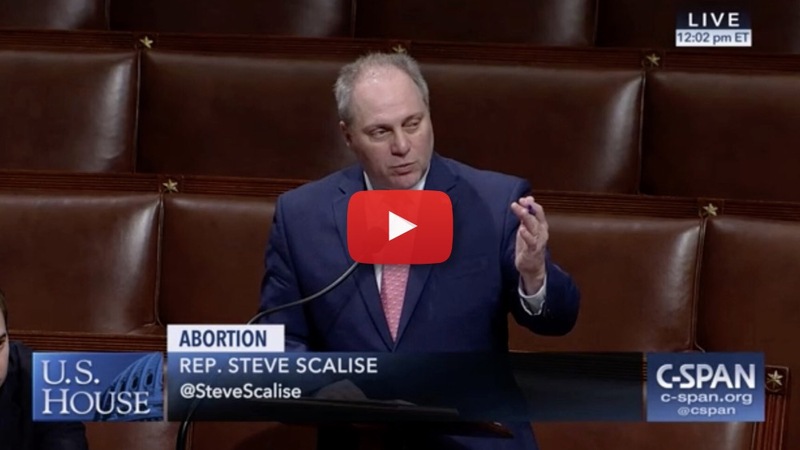 Whip Scalise then pressed the Leader on his choice to block the Born Alive Survivors Protection Act from receiving a vote on the House floor. This legislation would protect innocent babies who are born alive after a failed abortion. Click here or on the image above to watch the full remarks. Highlights from colloquy are below. “I’m encouraged by the conversations as I talk to different conferees. The issues that they are tackling and clearly the issue that has been at the front and center of the differences that we are trying to work through deals with border security. As we look to resolve the differences, ultimately it’s my hope that we find a way to properly fund the tools that are needed to actually secure the border, as our experts, our men and women who risk their lives to keep our borders safe, have laid out in detail. “Obviously technology, technology to help them do their jobs better, the need to increase security at ports of entry. To have more of the drug testing equipment that can do a better job of keeping drugs out of our country. But clearly part of that solution has to be some form of physical barriers. Whatever you want to call it, wall, physical barrier along the areas where we have the worst problems. “… Among the other things they were able to identify, able to stop just earlier this week, some of these people coming in: a person with a previous conviction in Georgia for child molestation, a Honduran man with a record in North Carolina showing a conviction for indecent liberties with a child, and another Honduran man with a Florida record that identified him as a member of the violent MS-13 gang. This is just one more example of people that are coming across our border illegally in areas, and the article notes this happened in the Rio Grande Valley sector of the southern border on Monday and Tuesday according to our border patrol agents, in areas where there is no physical barrier. “I would like to ask the gentleman about a piece of legislation that we filed that we’ve been trying to get unanimous consent to bring up. This is H.R. 962 a bill by my colleague Ann Wagner from Missouri. “I still don’t completely grasp how that’s legal in America that someone who’s born alive can still be killed and have that be legal in certain states. We have a bill called the Born Alive Act that would ensure regardless of how you feel about abortion, pro-life, pro-choice, after the baby comes out of the womb alive it shouldn’t be able to be killed. H.R. 962 gives that protection that It can’t be killed.